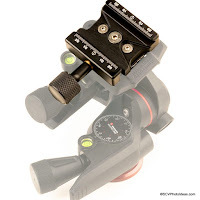 As history shows Hejnar PHOTO brand of Arca style plates and clamps has become synonymous with quality parts, regarding the conversion of Manfrotto® tripod heads into the versatile Arca-Swiss® style. 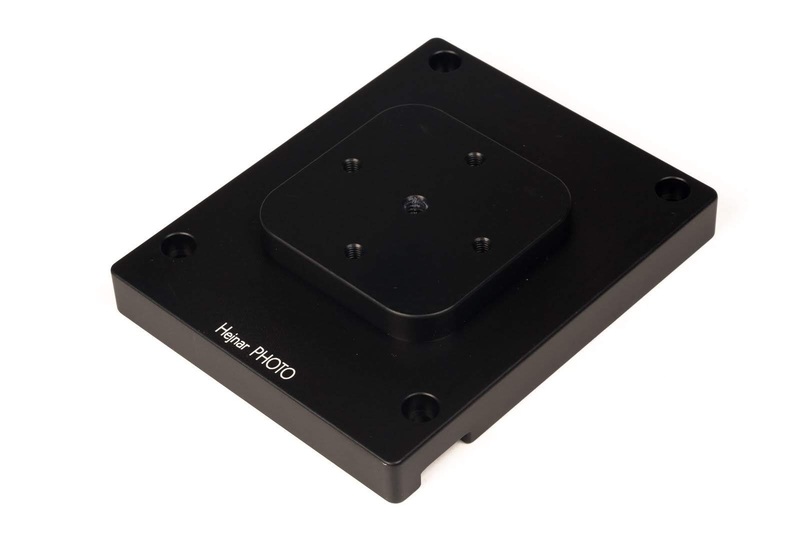 This time, it was the turn of the MVH502 A/AH Pro Video head to get its Arca-Swiss® compatible conversion set. Unlike most Manfrotto models we saw converted in the past by Hejnar Photo the MVH502 has a large platform on top, equipped with the proprietary RC5 Quick Release system, which utilizes the 501PL plates. 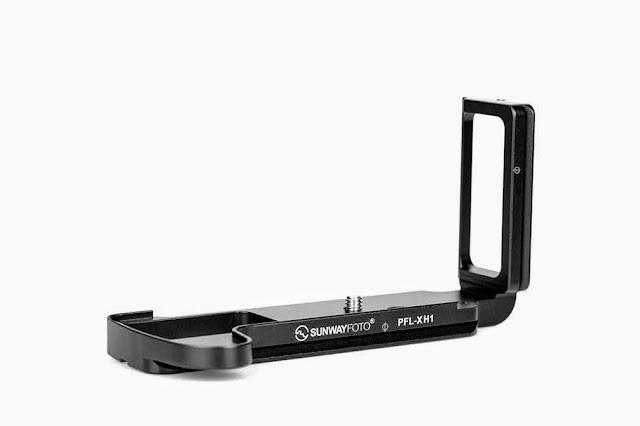 Nonetheless, 501PL plates are common to video heads but non Arca compatible as many DSLR videographers want. 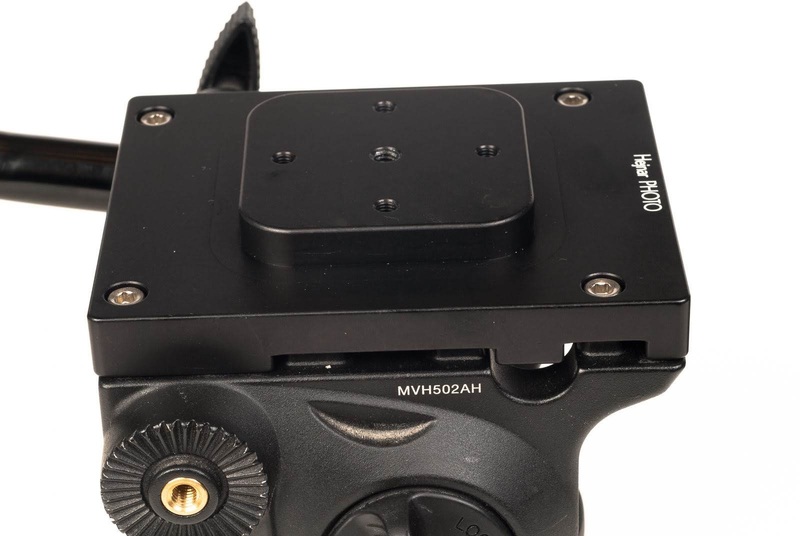 The Hejnar MVH502F63 set contains a custom adapter plate to replace the whole structure of the top platform with the RC5 connector, plus the larger 3.25" long Hejnar PHOTO F63b Arca-Swiss® compatible Quick Release clamp. The set contains all necessary parts, screws and tools for the conversion. 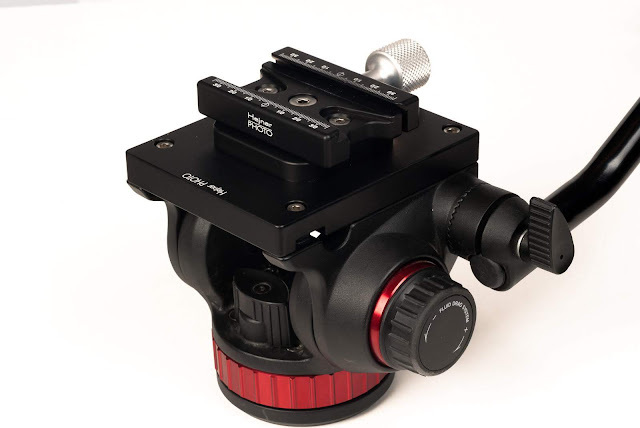 But basically the custom adapter platform and the Hejnar F63 Quick Release clamp as mentioned above. One 1/4"-20 x 3/4" flat head screw. 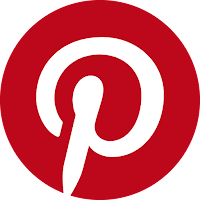 The conversion platform is built on two levels. 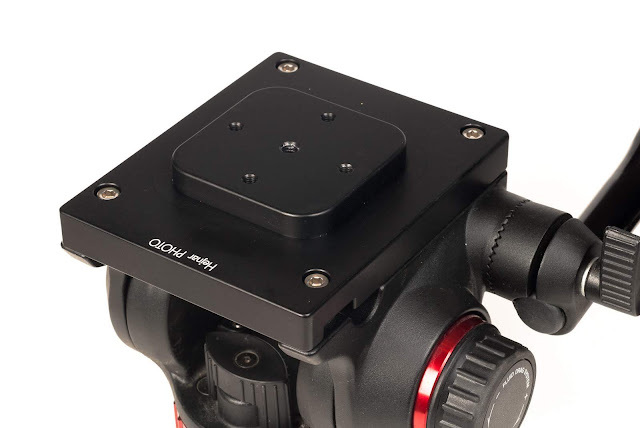 The lower level fits into the socket of the RC5 quick connect platform and the top a little elevated plate accepts the F63 QR clamp. 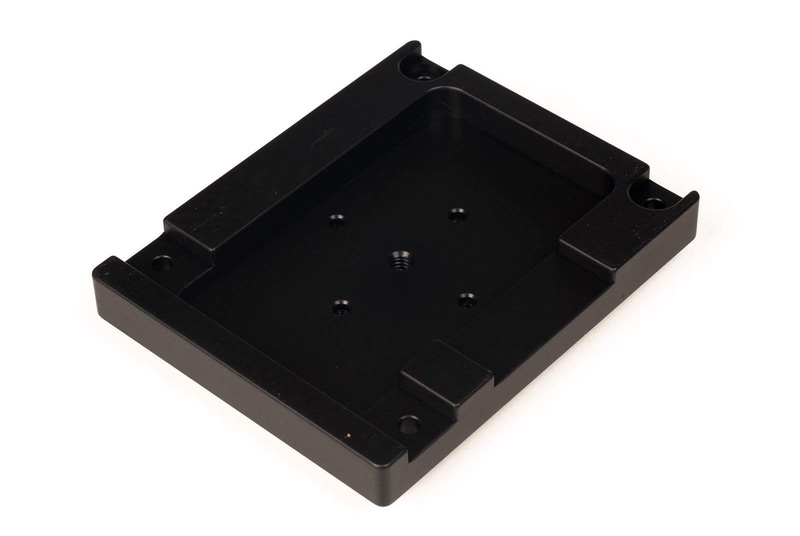 There are four socket holes one at each corner of the lower and larger platform, to accept the hex cap mounting screws of the original platform. Further, on the narrower top plate there is one tapped 1/4"-20 center hole, that corresponds to the center hole of the clamp. There are also four 10-32 tapped holes placed around the central 1/4-20 hole at 45 mm apart and in 90 degree increments. These smaller holes correspond to the side holes of the F63 QR clamp enabling its alignment and possible reorientation by 90° on the head. The bottom of the platform has the appropriate cuts and recesses in order to match with the head structure after the original platform is removed. Following the norm of all Hejnar QR clamps, the F63 is compatible with Kirk®, R.R.S.®, Arca-Swiss®, and many other Arca style Quick Release plates and rails. Been kept as an add-on unit, it can play different roles being used independently, i.e. mounted on another ball head and/or other equipment at will. 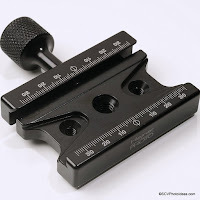 Is simpler and more straightforward than many earlier conversions on Manfrotto heads. Anyone with a little experience handling Allen hex keys and Spanners can do it in a few minutes. It goes without saying, that all conversions with Hejnar parts are completely reversible, with no modification or damage induced to the original parts which may be kept in a safe place for future reassembly if ever needed. 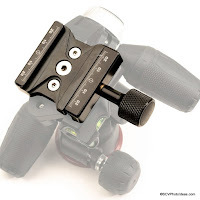 Remove four hex cap screws located at each corner of the original Manfrotto® mounting platform using the provided Allen hex wrench. 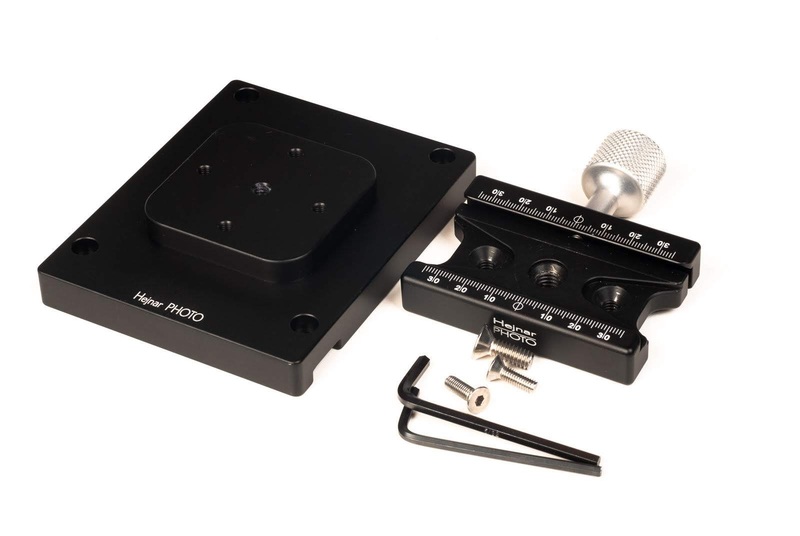 Attach MNH502 conversion plate to video head top using the same original hex cup screws. Mount the Hejnar F63 Arca style Quick Release Clamp. That's all, four screws off, then just align and position in the correct front / back orientation the new platform, four screws back and you're done with the top platform. 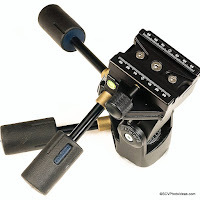 Next, the F63 QR Clamp is attached on top of the adapter plate, by at least two side screws which align the clamp or all three of the provided screws including one in the center hole. It's up to the end user to decide on the orientation of the F63b QR Clamp and the position of its screw knob, depending on the task in hand, since it can be screwed in any of four possible position, incremented by 90°. 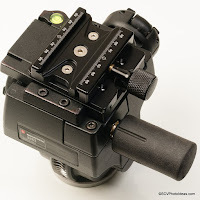 The Hejnar Photo F63 QR clamp mounted by 3 screws on top of the Manfrotto® MVH502AH video head. 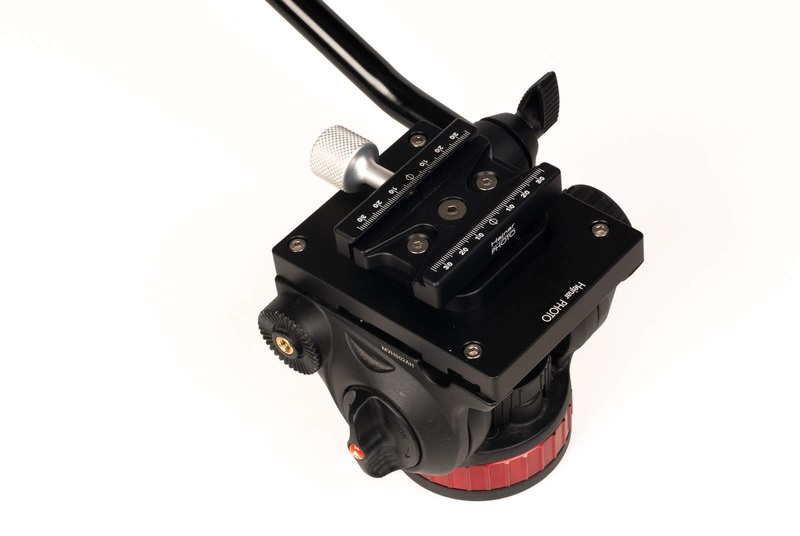 The clamp screw knob can point to any side the user desires allowing for adjustment of a lens or camera plate either fore-aft or laterally within its limits. 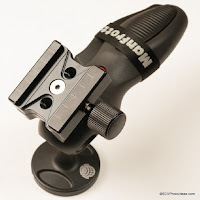 Furthermore, according to Hejnar Photo website the choice of QR Clamp screw knob color (black or silver) and size (short or long) is up to the user who should leave a note with preference upon concluding the checkout in the Hejnar Online Store. Current price for the MVH502AH + F63 Set is US$ 120.00 (+Shipping where applicable) The set is available from the Hejnar Photo online Store as usual, but also from Amazon.com or eBay. If you are interested in the product, do check the Recommended Sellers page for a valid Hejnar Photo discount coupon before ordering which is applicable only in the Hejnar Photo Online Store.